Bishopston Rugby Football Club are looking for new members to join their team. From doctors to students, the club is made up of an array of individuals. Jonathan confirms that the club runs two to three teams, each accommodating for players with different abilities. 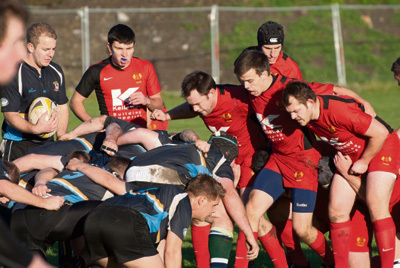 Bishopston RFC put two sides forward every Saturday, and three when the club has enough numbers. The 1st XV is for those who are able to play at a higher and more experienced level. The second and third teams are for the more social players. “We have struggled a bit this season,” says Jonathan. “The 1st XV currently play in Gloucester 1 and we’re eighth out 12.” The team has won four out of 11 games, and have drawn once. The team were unfortunately relegated last season after their first season in the Gloucester Premier Division. Jonathan adds that the 2nd XV are doing adequately in their Reserve League. Located on a floodlit pitch down Bonnington Walk in Lockleaze, the club practices twice a week on Tuesdays and Thursdays from 7pm until around 8.30pm. The training focuses on increasing fitness, with skill-based drills. Sessions are then followed by food in the clubhouse afterwards. The club is an impressive 118 years old and was originally founded by former pupils of Bishopston School. Bishopston RFC has been homed at various locations during its history; including the annex on the Memorial Ground. If you would like to find out more about the club and how you can join visit: www.pitchero.com/clubs/bishopstonrfc.